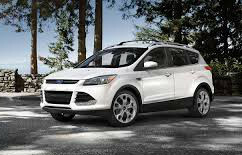 The 2014 Ford Escape offers upbeat power baked by 173 horsepower in the 1.6 liter engine supported by EcoBoost technology. Tight, controlled and responsive handling is appreciated in all conditions. The engine is a 1.6 liter, turbocharged four cylinder engine that puts out 173 horsepower, with a six speed automatic transmission doing the shifting for you. Handling, braking, and steering were all fantastic, and this is the sporty crossover (short of way more expensive European small crossovers) for the masses. 23 mpg city/ 32 mpg highway. This rated average for compact SUV's. The federal government says you can save $1,500 in fuel costs over five years compared with the average new vehicle. Annual fuel costs are $2,000 based on 15,000 miles of driving and gasoline costing $3.50 a gallon. It's rated at 23 city and 32 highway, and a combined city/highway rating of 26 miles per gallon. One point you do need to know, however, is that Consumer Reports said the "first year reliability of the redesign" of the Escape is "well below average", with CR's new car prediction of reliability rated at "much worse than average." But to be honest, we really didn't see any problems with our Escape like CR did. Mine was tight as a drum, built quite well, and not a single issue in that area. The biggest problems reported by CR came in the engine cooling, fuel system and audio system (MyFord Touch). A wonderful safety feature found in this vehicle is the MyFord, which connects to your smartphone and allows you to drive using voice commands so you keep both hands on the wheel. AdvanceTrac with RSC, plenty of airbags, and Ford's brilliant SOS Post Alert System , Traction Control , Brake Assist and Child Latch Seats. AdvanceTrac with RSC, airbags for driver knees, dual stage front airbags, front seat mounted side impact airbags, a safety canopy airbags , SOS Post Alert System, and on and on. This car is jammed with tech features you will love. From the Backup camera, Bluetooth, a USB port. Perimeter Alarm, Navigation System, great sound system with AM/FM/Sirius and MP3, Aluminum wheels showcase the vehicle. Standard equipment included aluminum wheels, auto halogen headlamps, some exterior bright work, dual power mirrors, fog lamps, keyless entry keypad, privacy glass, 10 way power driver and four way manual passenger seats, a 60/40 split fold rear set, ice blue lighting for instrumentation, illuminated entry, tilt steering wheel with cruise audio controls, air conditioning, AM-FM CD/MP3 system, power steering, locks, and windows, a rear view camera, Sync Voice Activated system, Advance/Trac with RSC, various airbags, and other items. The price also included optional equipment, and on our test model that included an SE convenience package, a reverse sensing system, perimeter alarm, and the SYNC voice activated infotainment system, a power lift-gate, and the MyFord Touch/Nav system. Ford has done a great job re-designing the car, updating the overall look that is universally appealing and inviting. Use of materials inside the car are equally as sharp and nice to the touch. Finishes and surfaces are well laid out and organized. Lay out and space are good - including the back where the 60/40 flush down seats are great for packing and storage. Cool, cool, cool! It looks like its moving fast when it is standing still, and a clever placement of character lines along the flank, a kind of a wedge profile overall, and a really exciting looking roofline as well performance style aluminum wheels give a strong sense of excitement to the Escape. Plus, this is probably the only small crossover that doesn't make the base model look like the consolation prize on "Let's Make a Deal." This is a hugely successful redo styling wise, and as far as I'm concern the most successful to date of all of Ford's current models except maybe the Fusion. Kudos! Back to the drawing board for the rest of you car companies! Still, in spite of all that applause, Ford now needs to address its attention to the rather plain look and inexpensive materials used inside the Escape - except for the dashboard which looks nice, expensive and futuristic--and as though it doesn't go with the interior at all! Let's spiff up the SE interior. If you're as bothered by it as I was, order the Titanium level of Escape which looks and feels much, much better. 3 years/36,000 miles bumper to bumper, 5 years/60,000 miles powertrain, 5 years/60,000 miles road assistance. The warranty on the Escape is for 3 years/36,000 miles bumper to bumper, five years/60,000 miles powertrain, and five years/60,000 miles of road assistance.